The Ultimate Kardashian Dictionary—How Many Words Do You Know? Let's be real for a second...the Kardashians have basically invented their own language. They've taken normal words but completely changed their meanings, so sometimes, it's a little hard to keep up. Pun intended. 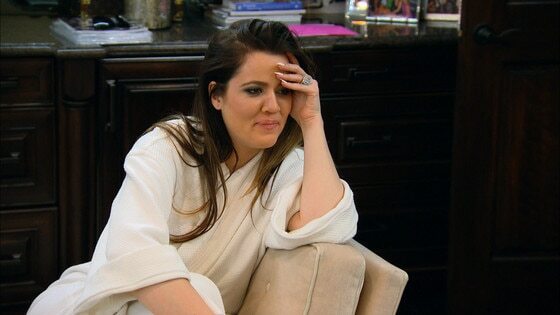 Anxiety: The Kardashians say this whenever something stresses them out, it might not actually be giving them anxiety, but it's def not making them happy. Bible: This basically means you're swearing that you're telling the truth. Dolls: A term of endearment for family members, friends and fans. They even dubbed their employees "Dash Dolls." Dramatic: Used when anyone is upset and people don't understand why. Commonly used when Kris Jenner is crying. Fab: Basically fabulous, but since they're busy and important people they don't have time to say the entire word. F--k: For most people, this is an offensive word, but for the Kardashians it's more of an everyday word. They throw it around to each other without any offense! Joke: Opposite of Bible. When something is super annoying, surreal or just not normal it's obviously a joke. Keeks/Keke, Koko, Kyle, Kenny: The sweet nicknames for Kim, Khloé, Kylie and Kendall that the girls use for eachother, also used by Penelope, North and Mason to get their aunts' attention! Literally: The Kards use this word in exchange for seriously, honestly, completely. Lord: Scott Disick has evolved from his early days as Scott and is now known as Lord Disick, The Lord or even LD. Nori: Nickname for Kim and Kanye's daughter, North West. Never used as the edible seaweed version of the word. Peasants: Anyone that is not Scott Disick. Rude: Kourtney and Kim are big fans of this one. They love pointing out when people are being rude and it usually is when the sisters are arguing. Selfies: The normal person version of taking a picture of yourself, except with perfect lighting, flawless makeup and an effortless pout. Shady: This is when something is sketchy, creepy or when a Kardashian believes they aren't being told the whole truth. Todd Kraines: A Kardashian family friend and center of the best family prank of all time. Totally: Often said in a drawn out tone, this word is used to add drama to an otherwise forgettable sentence. Troll: What Kim Kardashian calls you if you attempt to wake her up in the morning. Does that clear it up? How many words did you already know? Find out what else they have to say on season 10 of Keeping Up With the Kardashians! Season 10 of Keeping Up With the Kardashians premieres Sunday, March 15 at 9/8c on E! PHOTOS: See all of the latest Kardashian photos!